S. G. W. Benjamin : Surf Riding at Hilo, 1880. 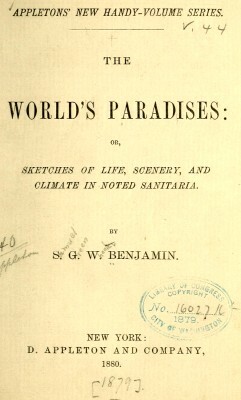 The World's Paradises: or, Sketches of Life, Scenery, and Climate in noted Sanitaria. One of many accounts of surfboard riding at Hilo Bay where there were a number of quality surf breaks and in ancient times its reputation was only surpassed by Waikiki. Given that the book is compilation from diverse sources, it is not suprising that the report of surfboard riding at Hilo is resembles several other earlier accounts, for example Charles Nordhoff's Surfriding at Hilo (1873). Wheeler account is remarkable for the brief, but succinct, analysis of the dynamics of wave riding, possibly describing the actions of a point break. ... it is only possible when the waves roll in obliquely toward the land. the continually repeated action sends the board forward as well as side-wise. Infants often learn to swim before they are able to walk. It is among the rollers at Hilo, on the island of Hawaii, that one sees exhibitions of what is probably the most extraordinary skill ever exercised by man in practicing the powers of flotation. The surf-board play is an ancient custom of the islands, but there is evidence that it is gradually going out of use. The first essential to this sport is a high sea, causing rollers combing over with regularity and height. The second requisite is a bread-fruit-tree plank, ten to twenty feet in length and about two in breadth. Taking this in his hands, the swimmer cleaves his way to the first line of breakers. Then, watching his opportunity, he dives under a coming sea, and is carried by the undertow some distance from the shore, when he rises to the surface and again awaits his opportunity. Soon a breaker of more than usual size heaves up, and as it takes the ground curls up-ward, and with a speed of forty miles an hour rushes toward the land. At once the swimmer throws himself on his board, and, keeping on the smooth slope of the mighty breaker just under the curling crest, is swept with lightning velocity to the shore. Sometimes some swimmer of unusual hardihood and skill stands upon the surf- board, depending on his balancing powers to escape the fury of the seething surge that ever threatens to swallow him up. the most thrilling character, and one is not surprised to learn that sometimes the daring adventurer loses his life for his audacity. The philosophy of the sport seems to be that it is only possible when the waves roll in obliquely toward the land. As one part of the comber touches the shore and breaks and dissolves, the continually repeated action sends the board forward as well as side-wise ; and thus between forces acting in a tangent the swimmer is impelled safely where one would suppose only destruction could be his fate. It is altogether likely that the discovery of the possibility of thus gliding along the slope of a breaker was due to accident, like so many other inventions. 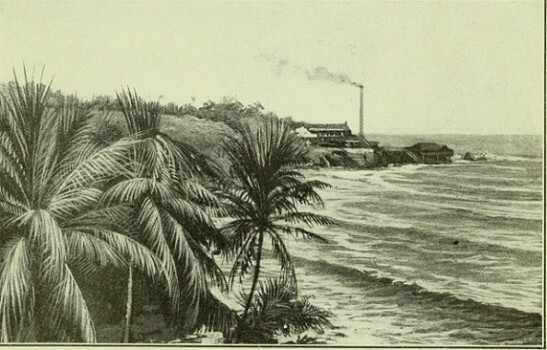 Sugar Mill in Hilo District (Wainaku). or, Sketches of Life, Scenery, and Climate in noted Sanitaria. Geoff Cater (2012-2017) : S. G. W. Benjamin : Surf-riding at Hilo, 1880.